A: We can swiftly remove splashes with either external window cleaning (for four-storey properties), rope access window cleaning (for high-rise properties), or via the common manual cleaning of interior casements. Q: Can you share with me a tad more about your water-fed pole cleaning technique? A: Absolutely! This gear can stretch up to 22 metres in length, allowing the team to effortlessly reach and clean even the farthest corners of your glass surfaces. A: Our water is purified from any residue-causing minerals. When this fluid evaporates under the sun, it won't leave any splodges behind. A: Rainwater is usually clean, so it won't stop us from doing our work. However, while we won't be bothered by a slight shower, a sudden cloudburst can lead to unsatisfying results. During thunderstorms, we may have to postpone our service for a day of your choice to ensure the technicians' safety. Q: Do I need to wait in my home or office until the service is done? A: No, the trained window cleaners in Bethnal Green can easily perform outer window cleaning without you being around, as long as your property gates are unlocked. And if you want your windows to shine on the inside, just book our free of charge key pick-up and delivery alternative instead. 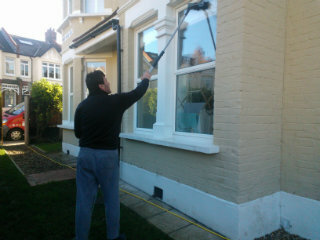 A: Yes – we will clean your PVC or UPVC frames and sills at no extra cost! With the efficient water-fed pole gear, the professionals can help you outclass your competition at modest prices. And you can lower our window cleaning Bethnal Green rates even further by mixing two or more of our cleaning services together! To learn the exact amount behind our price offers, make sure to stop by our handy price table below. No matter where your streaks have taken shelter, our resourceful window cleaning in Bethnal Green will fight them off with ease. We have encompassed various washing methods. Our external window polish is aimed at properties that do not exceed four floors. To let the sunshine back inside, the window cleaners in Bethnal Green will arrive in a vehicle, supplied with a retractable water-fed rod. This system is linked to a water storage, filled with filtrated water. After being pushed as a powerful gush from the pole's brush-head modification, the liquid will erase all dust build-up in an attempt to renew its natural structure. To reach muddy window corners of high-rise properties, we'll send a proven team for rope access window washing. These approved climbers will employ frequently inspected ropes and harnesses or position ladders and cherry pickers to restore the appeal of your panes. We've got all necessary COSHH reports in place and follow each and every safety instruction. To make the in-house facet of your glass façade just as lustrous, the pros will rely on the ordinary ladder and squeegee cleaning approach. As our client base broadened, we augmented our window cleaning in Bethnal Green to encompass other London districts as well. Please refer to our short list to learn which close by locations we visit. Another quick and easy way to get a free instant quote or to book window cleaning services Bethnal Green E2 is through our web site.